Prepare cake according to box directions using a 13x9 baking pan. Remove from oven and cool for ten minutes. Use a serving fork to poke holes an inch or so apart all over the cake. Add the powdered gelatin to the boiling water and stir until dissolved. Slowly pour gelatin over the cake. Refrigerate cake for 45 minutes. 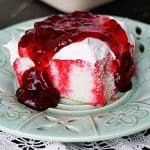 Remove cake from the refrigerator and frost with Cool Whip. Top Cool Whip with pie filling. This recipe for Raspberry Dream Poke Cake was printed from AmandasCookin.com - https://amandascookin.com/raspberry-dream-poke-cake/ and can only be printed for education or personal use.